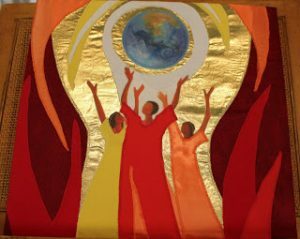 The Association of Roman Catholic Women Priests (ARCWP) joins Women’s Ordination Worldwide (WOW) in celebrating the World Day of Prayer for Women’s Ordination by ordaining Elena Garcia, a deacon, at St. Andrew UCC at 4:00 pm in Sarasota, Florida. Elena will then baptize her grandson, Brohdi Lucas Courtney as her first act of loving diaconal ministry. All are welcome! We give thanks for all in our Roman Catholic Women Priests Movement who, since 2002, are living God’s call in a renewed priestly ministry that welcomes all to celebrate sacraments in inclusive faith communities. We have grown from seven brave women ordained on the Danube in 2002 to approximately 240 internationally in Europe, North America, South America, Asia and Africa.